Many mosquitoes in your area? Not sure if your neighbourhood has been affected by dengue? 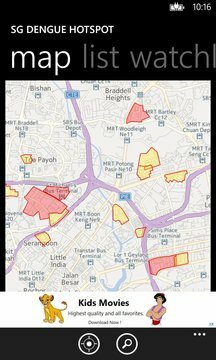 You can now find out all the dengue hotspots in Singapore right on your phone! With the app you can always be aware of hotspots and clusters under watch near you and take action to keep yourself and your neighbourhood safe. All hotspots are displayed on a map as well as a list. Hotspots are highlighted with either red or yellow based on their severity. You can keep track of clusters that are under surveillance too. The app also includes support for voice commands! 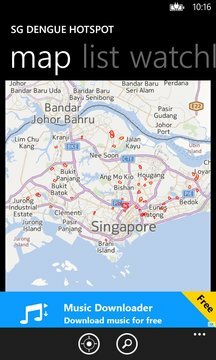 Simply activate voice commands on your phone and say "Dengue Hotspot Jurong (or your location)" to see if the location is a hotspot. You can view random hotspot information on the application live tile or even pin a hotspot as a secondary tile to stay updated on a specific hotspot. If you like the app, please rate it and share it with your friends!